Image 1 : Kurdish New Year concert in Grande-Synthe. Source : Thanh Ly. Europe is going through a crisis that the media present as major, the so-called “migrant” or “refugee crisis”. With the terrorist attacks, the numerous wars in the Near East and Middle East, and a World in which instability has become the rule, European societies are compelled to think about how to welcome migrants and offer them hospitality. This has however turned out to be a test as this migration has been politically reframed in the public debate and the policies of the European Union. These massive new migrations, which Alain Tarrius (1989) identifies as at the origin of a “between poor” globalization, organised in an underground economy, are also composed of geopolitical migrations that are made up of exiled migrants who are trapped in the nets of the constraints and juridical laws of the EU, the complexity of political asylum, and therefore launched into a nomadic exile that looks like roaming (Bolzman 2012). Lying at the heart of these particular forms of mobility, some territories like Italy, Greece or the North of France have become ultimate borders, gateways as well as sticking points towards countries imagined as lands of welcome. The permanent presence of the exiles since the middle of the 1990s and the Kosovo war has taken different forms according to either the geopolitics of the conflicts which have lead people on the road from around the world, or the structure of transnational systems of “passage” and illicit work, and the numerous and often incoherent public policies of emergency shelters, care, and more often expulsions, about which Saskia Sassen (2014) says they form a major system of the global economy. On the other hand, there has been a permanent feature : the migrants’ insecurity, which is paradoxically reinforced by the fact that they are kept in “safe” places such as HCR camps. Far from the enchanted visions that some analysts develop, making the encampment the model of a town to be, flexible, self-managed and adaptable, the migrants are in fact submitted to the violence of the situations they experience, of their imposed settling in the “jungles”, the town squats and the carceral environment of the camps. They face intracommunity violence, “ferryman” violence, repressive violence, psychological violence due to the fear of detention and expulsion, as well as self-imposed violence. In these conditions, the actions of organisations constitute the minimum level of protection that life requires, a form of social if not spacial hospitality. The volunteers who are involved in support activities for migrants — who are, juridically speaking, refugees or not — are faced with situations that do not belong to the usual frame in which migratory facts are conceived of. Most of the time, they do not organise their welcome in the scope of “integration” but in the perspective of humanitarian protection in between political asylum or during the interval of border-crossing. These situations are characterized by specific relational links that develop between migrants and militants, who are sometimes also nomadic and are members of transnational networks or NGOs, but whose mobility is experienced differently since it is secured by official organisations. Among these places of roaming, there are “jungles” and centres or camps, which are different in the way they institute the political regime of visibility of the migrants. On the one hand, camps are places where different politics of management of the transitory are exposed — such contrasts exist between Calais and Grande-Synthe, two camps which can be seen from the motorway. 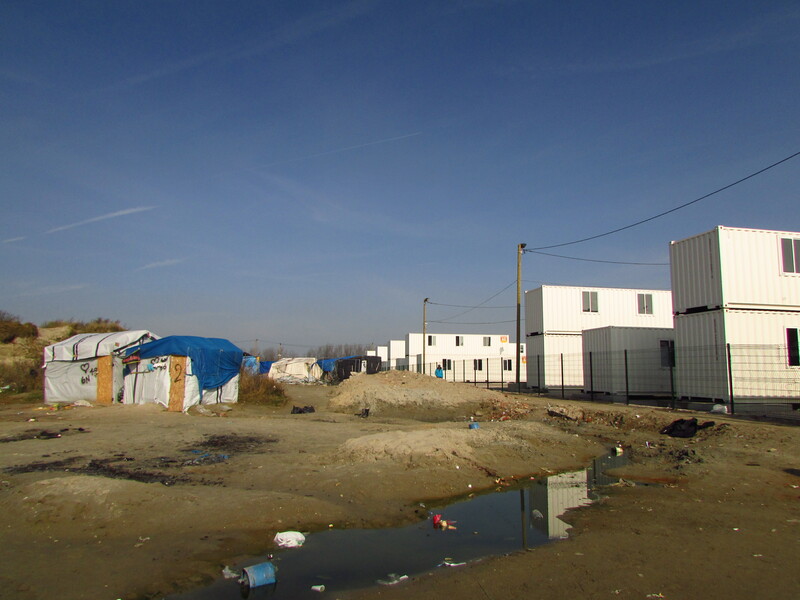 In Calais, the camp is next to the “jungle” and made to replace it. Its containers, railings, sentry boxes, automatic turnstiles tend to standardize and neutralize the diverse conditions, origins, trajectories and communities, and contrast with the “jungle” or slum. In Grande-Synthe, the huts mended by the migrants, the buildings made by the various organisations and NGOs, and the smiling volunteers symbolize the municipality’s political and militant choice of welcoming. On the other hand, in the “jungles”, fading away from visibility is the rule — there are paths known only by insiders, shrubs which protect from the policeman’s gaze. “Jungles” are transformed into camps by public intervention when they become “too” visible. Genuine chronotopes of contemporary processes of globalization, “jungles” and “camps” are also places that produce a specific transitory culture. One settles down only temporarily in these places that can be so easily closed or demolished, and which change everyday as new buildings emerge or are set on fire, as people leave or arrive. The stakes are political as well as cultural, humanitarian and scientific. Image 2 : Calais. Source : Stéphanie Espejo. This is why social sciences must concern themselves with this question : how must we conceive of these places of transition and the activities that are organized by migrants as well as volunteers or workers who are involved, in forms of hospitality which unite their intense commitment to the precariousness of these actions? In France, these places are not exactly humanitarian camps. The standardization of the humanitarian intervention is not very strong — although it is increasing — because the professional actors of humanitarian actions, such as medical NGOs, are dealing with a committed and voluntary crowd which deploys an energy that is more vital than organized. In this crowd, one element particularly sticks out : the strong presence of the cultural world. Camps and “jungles” have little by little become places of cultural actions for the actors of the region but also for European artistic networks. Creative workshops for children who miss school, shows and concerts, screenings of films to pass the time, all create links during the moments they share and sustain the production of an original cosmopolitism. Art in the camps and “jungles” is not limited to cultural or artistic shows even if these are numerous, nor to the cultural practices of the migrants and exiles themselves. The social elements of culture are also important in humanitarian work. The interventions and their mediatisation can make their values and social conventions concrete and reinforce them. 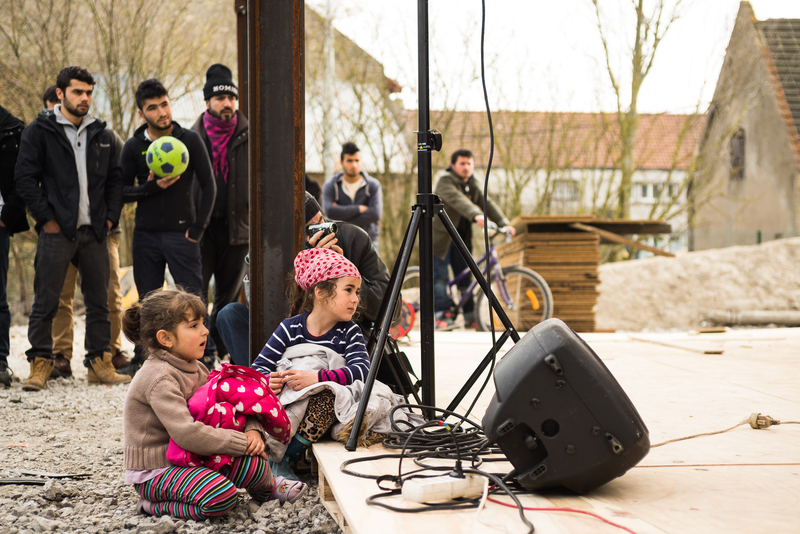 Faced with barbed wires, artists and volunteers construct another form of common space; they establish solidarity networks in action. These interventions differ according to the various “worlds of culture”: the English separatists born with free parties like Aid Box Convoy, the French cineasts of the “800 call”, the numerous collectives set up for the occasion. Beyond the diversity of the origins, the different aesthetics of the constructions can be observed: the customized containers, wooden sheds, artists and performers living on the spot, micro-theaters, cultural and artistic creations and practices of the migrants themselves. Music and cinema occupy a place of their own. This transforms the camp into a hybrid space that lies between a humanitarian camp, a more or less cosmopolitan slum, a makeshift camp, and an alternative festival. This hybridisation creates a strong spatial and social singularity. The association in charge of Grande-Synthe, Utopia 56, is made up of volunteers from Brittany who professionally run the camping area of the Festival des Vieilles Charrues. Yet there is a long way between shows that are offered as pastimes and the migrants’ musical experiences that allow them to momentarily inhabit a time-space. Furthermore, there is a disturbing gap when the wonder before the cosmopolitism of these places is at odds with the day-to-day violence that the migrants experience. This violence springs up whenever there is a police intervention, a fight, but it is also something that the migrants impose on themselves by stitching their lips and burning their fingers. In this context, the role of social sciences is no doubt to understand the strength of the cosmopolitanisms that arise from these situations, and testify to the diversity of the experiences that they create without softening them. At this cost, it becomes possible to grasp the modalities of the production of a specific transitory culture as well as the role that art and culture play in temporary situations and contexts. Agier, Michel. 2008. Gérer les indésirables. Des camps de réfugiés au gouvernement humanitaire. Paris : Flammarion, coll. « Bibliothèque des savoirs »). —. 2013. Campement urbain. Paris : Payot & Rivages. Agier, Michel (dir.). 2014. Un monde de camps. Paris : La Découverte. Bolzman, Claudia. 2012. « L’exil : ruptures, épreuves, preuves, résistances » (Re)Penser l’Exil. Sassen, Saskia. 2014. Expulsions. Brutality and Complexity in the Global Economy. Cambridge : Harvard University Press. Tarrius, Alain. 1989. Anthropologie du mouvement. Caen : Paradigme. Le mot « jungle » a été utilisé par les militants et les journalistes en référence à un mot afghan signifiant « le bois ». Son efficacité politique — racialisation des habitants et désignation d’espaces sans droits où tout est possible — a depuis été soit critiquée soit revendiquée selon les angles des recherches et des perspectives politiques. Nous l’utilisons ici pour désigner les campements précaires, comme les acteurs de terrain et les migrants eux-mêmes le font. L’usage du mot « camp » est controversé pour désigner ces différentes zones de mises à l’écart gérées publiquement. Ici, nous l’employons au sens commun de « camp humanitaire » et dans une perspective développée entre autres par Michel Agier (2008, 2013, 2014).